First off, Happy Father's Day to all of the fathers out there. For myself, and I'm sure for the majority of you, we are pursuing financial independence not because we hate working. Rather it's because we hate the things we miss out on because of work which in many cases is family. Whether it's having to work late to meet a deadline or travel out of town for work, whenever you are forced to keep a job to maintain your lifestyle that comes with a sacrifice. However, if you combine consistent saving and investing and give it enough time compound interest can do amazing things and allow you the freedom to enjoy more time with family. This is my first father's day and coincidentally enough it's also Luke's 7 month birthday. I can't say things have gone exactly as I expected but there's very few things that do. It's still hard to believe that Luke is 7 months old today but it also seems like an eternity since he was born. He had another very up and down week but he's currently back on a more stable trend which we hope will continue. I didn't make any purchases for my portfolio this week which is actually a bit disappointing. I have a few companies in mind that I'd like to add to but by the time I had some capital transferred around and in my brokerage accounts the stock markets rebounded back some. I expect to make a purchase or two this week if there's a slight pull back in the share price of the companies, but Mr. Market will be the deciding factor in that. Sometimes when I get some free time I like to check out TED talks because there's a wealth of knowledge and always very interesting topics. Here's an interesting speech about the "Price of Happiness" and how some of the highest priced items in their categories aren't worth anywhere near the price that's charged of them. 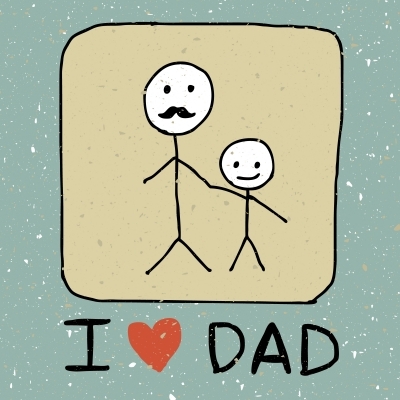 I hope you all have a great rest of the weekend and Happy Father's Day! Image courtesy of nongpimmy on FreeDigitalPhotos.net. Thanks for the mention PIP! And Happy Father's Day! Happy Father's Day, bud. Hope everything continues to get better for Luke over there. Hey JC. Thanks for sharing and appreciate the support. Hope you're having a wonderful Father's Day. I wish you and your family the best. Wish us well and cheers to us. Take care my friend. I missed some good reading this week - thanks for the update! Happy Fathers Day. I too have been working very late to make trades with the intraday SGX signals and they are really giving me return too.